German and Italian authorities have confiscated Shuanghuan Bubbles. TURIN -- A Chinese car that looks similar to Mercedes-Benzs Smart ForTwo could be cleared for European sales as early as mid-January, people familiar with the matter told Automotive News Europe. Lawyers from Mercedes and Italian importer Martin Motors are close to settling legal actions that have blocked European sales of the Shuanghuan Bubble minicar for more than a year. Despite having four seats, the cars exterior strongly resembles the two-seat Smart minicar. Shuanghuan Automobile sells the Bubble as the Noble in China but uses the Bubble name in Europe to avoid a legal dispute with British sports car maker Noble Automotive. The legal battle between Mercedes and Milan-based Martin Motors, which is Shuanghuans European distributor, began just before the opening of the IAA in Frankfurt in September 2007. At that time, Mercedes obtained a German court order banning sales of the Bubble in Germany. Mercedes claimed the car infringed its copyright for the Smart ForTwo. A month later, Martin Motors counter-sued Mercedes. It sought damages of more than 100 million as compensation for lost Bubble sales. Mercedes is now ready to allow the Bubble to go on sale in Europe because it fears it could lose the court case and be forced to pay damages, Italian legal sources told ANE. We expect the entire matter to be resolved in an amicable way, a lawyer familiar with the case said. German customs officials are still holding the first Bubble unit that was shipped to Germany from China to appear at the 2007 IAA. Customs officers confiscated the cars before they reached Frankfurt. Italian authorities are holding six Bubbles in a logistics center near Milan. The cars were imported for sale in Europe. 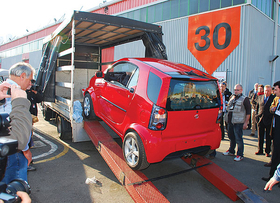 In December 2007, Martin Motors tried to show the Bubble at the Bologna auto show, but Italian police seized the show car while it was being unloaded from a truck that was transporting it from Romania. Last month, a court in Milan rejected BMWs claims that the Shuanghuan CEO, which also is distributed by Martin Motors, is a clone of the first-generation BMW X5 premium SUV. A legal source said that the Milan court ruling against BMWs claims has pushed Mercedes lawyers to be more cautious. The Milan court ruling against BMW said consumers could not get confused when similar vehicles are offered with a significant price difference. Martin Motor is preparing to launch European sales of the Bubble after the summer.